Chassis no. ZLA831AB000554894 - Engine no. It ran the 1992 Rally Monte-Carlo (#11 Bugalski/Giraudet) and Tour de Corse (#12 Aghini/Farnocchia). Chassis 554894 is a December 1991 Lancia Delta HF Integrale (Evo 1) (Gruppo A). It was registered on the 14th January 1992 in Italy with registration plate TO45702S and Fiat Auto Spa was the first owner. Abarth was part of the FIAT group. It is a lighter version made with slim metal sheet by CECOMP and with various solutions in order to reduce the weight for asphalt races. CECOMP Spa (Centro Esperienze Costruzione Modelli e Prototipi) is an Italian automotive company established in 1978 by Giovanni Forneris and is based in La Loggia, Turin. The company specialises in developing prototypes and models for car manufacturers, at the time it prepared the official cars for the Lancia Abarth. This “Deltona” ran the 1992 Rally Monte-Carlo (#11 Bugalski/Giraudet – Team Jolly Club/Martini Racing). This car belongs to the latest version of the Delta which debuted gloriously winning with Dieter Auriol his first race valid for the World Rally Montecarlo 1992. Juha Kankkunen reached the third place while the young driver Philippe Bugalski, making his debut on car with four-wheel drive, finished in fifth place. 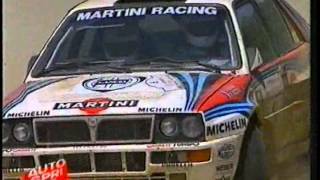 After that it ran the 1992 Tour de Corse (#12 Aghini/Farnocchia - Team Jolly Club/Martini Racing) reached the sixth place. In these cars also “called Evoluzione or Evo 1” the written Lancia and the Lancia logo were slightly reduced, while the Martini Racing colors were more evident.